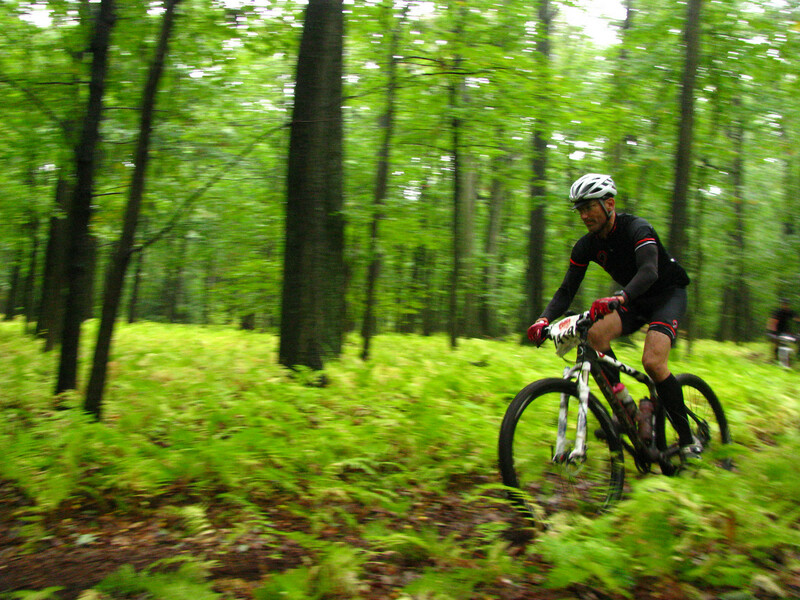 The Terror of Teaberry the final race in the Michaux Endurance Series may be the shortest mileage-wise, but it’s also the most technically difficult. To make matters worse, overnight rains that continued through till about 1pm made the dirt into mud and the abundant rock formations slick. With average speeds that are in the 8-9 MPH range, skillz are the word of the day. If you can ride slippery rocks, you’ll do well. Bang! A Lemans style start brings us back to our bikes with heart rates soaring. The run wakes me up. I feel good. I’m easily in the top-15 just behind Jay Dodge, another Masters rider, as we head into single track. One mile later we’re on a gradual primitive fire road climb with a preferred line but good passing room. I’m pedaling hard, I’m on my geared Superfly and we’re on one of the few fast sections of the course. I start catching and passing single speeders including Nate big air Shearer and Cupcake factory rider Travis Coldsmith, They seem a bit under geared for this section. As I pass Jay Dodge he gets on my wheel. Finally I settle down on the wheel of fellow 29er Crew rider Kyle Lawrence. I’m probably in 7th or 8th place! What am I doing up here? I just passed a bunch of guys that are going to eat my lunch once we hit the rocks. I made a mental note to myself to try to not to hold anyone up. As the climb turns downhill it gets a bit bumpy. Suddenly Jay yells: Roger, your saddle bag came off! I feel back there and sure enough it’s gone! Here we go again, three miles into a 5 hour day and I my ability to fix anything is gone… or at least up the hill on the trail somewhere. Do I stop? I decide yes, pull off and start hiking on the side of the trail back to find my saddle bag. After what seemed like an eternity of fruitless searching, the entire field has gone by, I give up and once again I’m nearly DFL and worse I can’t fix a flat without help. I’m going to need some luck today. As we make our way south we pretty much are in single track 90% of the time. The rocks range from just a few here and there to full rock gardens where you don’t touch any dirt to huge rock formations that you must ride up on and over. It’s the last category that makes the Terror of Teaberry so terrifying… and so completely cool. We’re in single track now and I start catching and passing riders that got by me during my fruitless seat bag search. I see Kyle on the side of the trail testing his rear tire. I ask: Need anything? He says he’s ok and I ride on …as if I have anything to give him anyway. Not five minutes later, I pass Jay Dodge working on a double flat near the first aid station and ask again if anything was needed. He said no and I keep going. 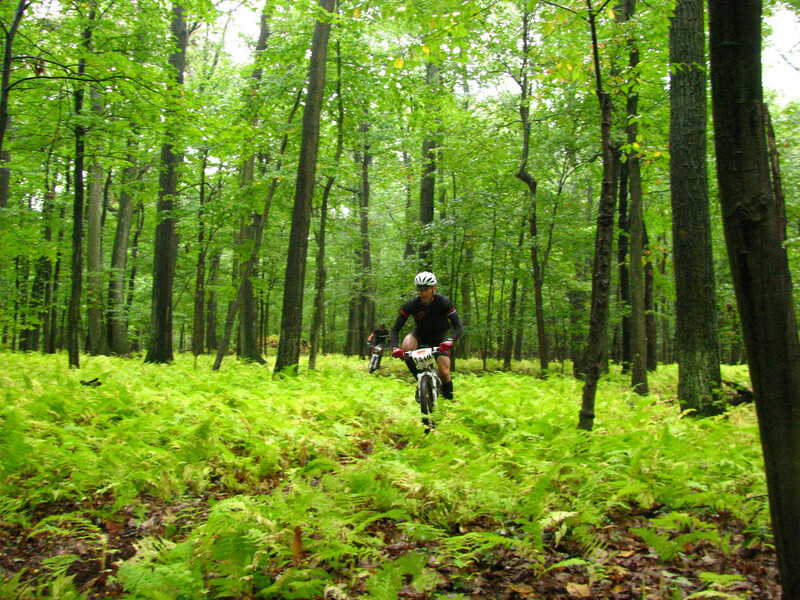 It takes awhile of chasing, but I finally catch the Bike Lane rider Mike Buchness in some single track. I’m feeling good about this since I know Mike is fast in the trails. I ride on his wheel for awhile till we pop out onto fire road. I slip away as we start to climb. The southern end of the course features Michaux rocky ridge riding at it’s finest. At first I was pretty confident. As the features got bigger I started having doubts. The rocks were feeling really slippery in the rain. I wish I was on the wheel of Nate, Kyle, Travis or even Bernie Shaio one of my Masters competitors… even if only for a few minutes. I need some confidence, some schooling. These guys can really ride the rocks. As if on queue, Bernie approaches from behind on his Superfly Single Speed. He’s running a super easy gear 32×24 which actually looks perfect in the rocks but must really blow in the fast sections, no wonder I’m ahead of him at this point. I’m already off my bike as he meticulously picks his way around me. I have no chance of grabbing the wheel since where I am is so technical, a successful remount seemed next to impossible. In a moment, he’s gone. Awhile later, Kyle Lawrence catches me from behind and again I’m off my bike. Only this time the section is really not that bad and I should have been riding it. I was getting fatigued and beaten down by the relentless rocks. He politely passes as I get out of the way. He’s super smooth. He’s riding like he’s so light, he’s just flowing over the rocks moving smooth and fast. My luck runs out at around mile 25. Feeling the softness of a slow leak in the rear, I ride until I’m down to about 10psi, hop off and start jogging with my bike. I actually have a tube and a CO2 in my pocket, but the head for my CO2 is in my bag somewhere back near mile 3. The 2nd aid station should be within a mile or two. After a bit, Buchness catches me and asks: why are you running? I explained how I either need a CO2 head or a pump. He gives me his pump. He’s off and I begin the repair. Doh, no tire lever! …everything is in my saddle bag. A minute later Jay catches back up and loans me a tire lever. As he rides off, he reminds me that a quick-release skewer will work in a pinch. Feeling like a rookie, I change the flat and try to get fired up for a final blast to the finish. I’ve been off my bike so much it feels like we’re not even racing anymore. I finally make to the finish in a less-than-impressive 5:18. It was only 35 miles, but somehow I feel way more tired than I did after SM100. The Garmin Data shows 4:41 of moving time which seems more respectable. In terms of the series, the battle that I was anticipating for the Masters title was a bit anti-climatic. Jay Dodge missed the 2nd race. Mike Capraro stopped racing mid season with a knee injury. Mike Funk and Shawn old man Withers were Teaberry no-shows. Huh? Where were you guys? Finally my super-fast cyclocrossin’ friend Bernie Shaio, who was the Masters race winner, would have won the Masters series by 5 minutes or so over me in a tight contest, but he mistakenly raced in the single speed category for the 1st race. Doh! So thank you fellas… for my 2010 Michaux Endurance Series Masters title. Feels like a gift from friends! Congratulations to Cheryl Sornson for winning the women at 4:39 and the series. She really knows how to get it done on her technical home turf. 29er Crew teammate Kyle Lawrence was 9th on the day at 4:44 and 3rd in the open series. Nice. My good friend Jed Prentice got edged out for the Teaberry win at 4:24 in the Vet class but managed to win the 2010 vet series. 4:24? That’s awesome. Mike Buchness was 4th on the day in Vet at 5:08 and 2nd in the series. Well done. Travis Coldsmith earned 2nd in the single speed at 4:26. Home boy rockin’ his home turf. Huge thanks to Gettysburg Bikes and all the Michaux Race volunteers that put this fantastic series together. The riding in the 85,000 acre Michaux State Forest is humbling. It’s as raw, beautiful and technical as any mountain biker could wish for. If you think you’re ready to test your skills, come out next year and race. These are unpretentious low-key events that feel like they are deep in the woods. There are 10, 20 and 40 mile distances to suit all levels of ability. See you next year. This entry was posted on September 13, 2010 at 7:24 pm and is filed under Must do Races. You can follow any responses to this entry through the RSS 2.0 feed. You can leave a response, or trackback from your own site. Well written and well ridden Roger. Rocks are fun. I’ll keep my eyes out for your bag up there. Hi Larry, Thanks! I actually went back and retrieved it afterwards. It was about 3 miles in. The quick-release attachment clamp actually failed. It was good to see you out there as always.